About four thousand workers staged a sit-in outside parliament in Rabat yesterday in a show of popular protest against socioeconomic policies that are economically harmful to working people, among them planned pension reforms, a freeze on talks with civil society groups and ongoing violations of worker rights–including the government’s refusal to negotiate with trade unions on wages and working conditions for public service workers. Protesters expressed solidarity with student teachers beaten by police last week while peacefully marching against the decision to reduce their stipends and block their path to teaching jobs. The sit-in is a follow-up to last month’s nationwide strike by national and local public-sector workers, organized by the four largest trade union confederations in Morocco. 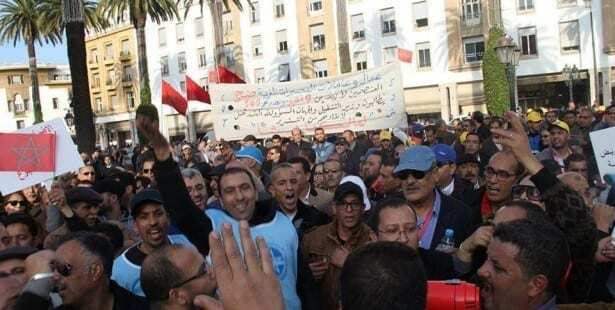 Miloudi Moukharek, general secretary of the Union Marocaine du Travail (Moroccan Labor Union, UMT), said all four federations are united against the government’s unpopular policies and its unwillingness to engage in dialogue with workers on wages and other issues. Images and video footage of police attacks on young protesters around the country on Thursday last week went viral on social media, inspiring condemnation from local and international sources. The sit-in was organized by the Confédération Démocratique du Travail (Democratic Labor Confederation, CDT), the Federation Démocratique du Maroc (Democratic Federation of Labor, FDT), the Union Générale des Travailleurs du Maroc (General Union of Moroccan Workers, UGTM) and UMT. Solidarity Center partners with the CDT and the UMT.